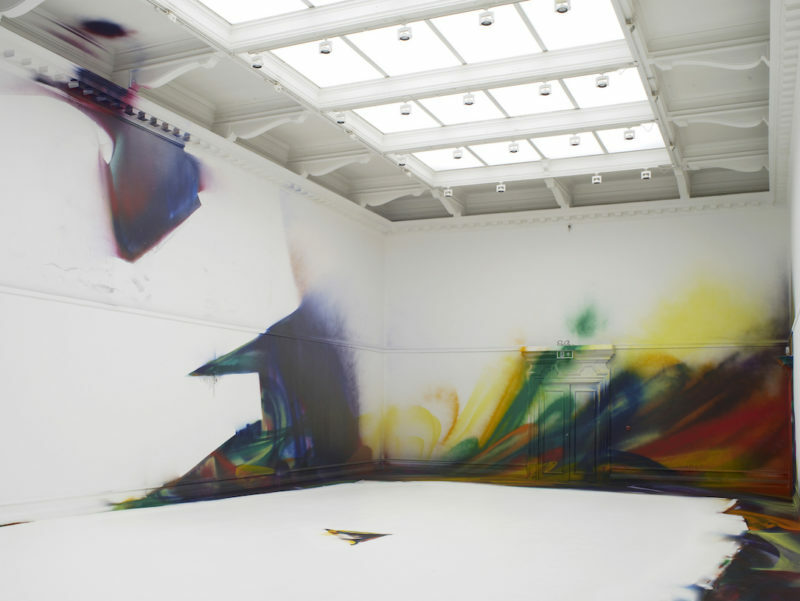 Katharina Grosse is a German painter. 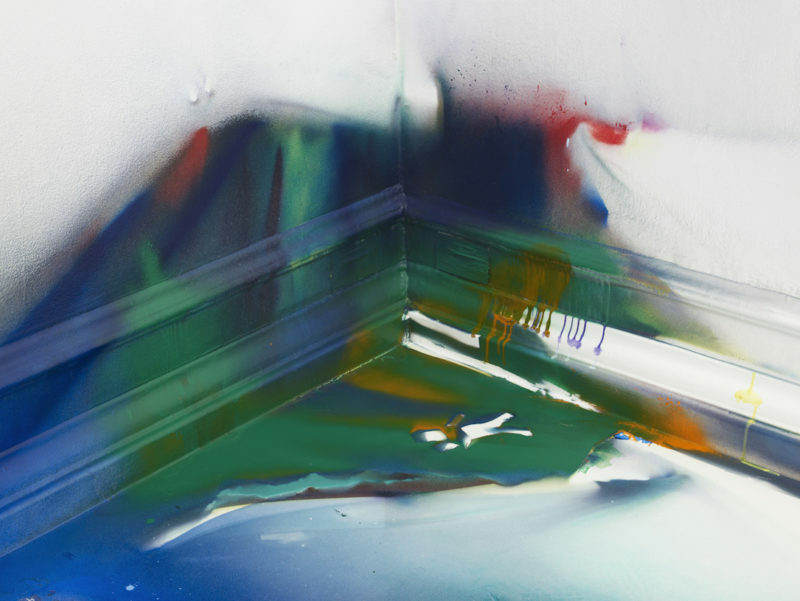 Or, alternatively, Katharina Grosse works in a style that is both German and painterly. 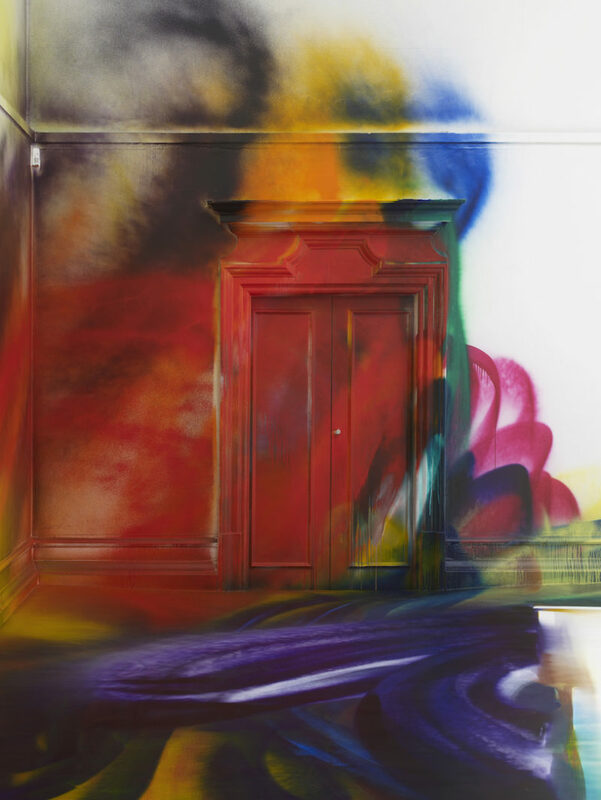 Or, alternatively, Katharina Grosse makes big, bold, but nonetheless orderly gestures, with a muscular, forthright tone; and which, in the words of the press-release, are ‘unhindered by traditional boundaries’. Previous works have used the Danish coastline and an old army base as canvases, and through the application of mincemeat colored swirls, made mincemeat of these landscapes also. Now however, Grosse has turned her attention to the South London Gallery. Fuzzy, occasionally drippy splodges dominate the main exhibition space, the petrol hues of which are interrupted by large and precise intervals of white. This effect, also employed by the artist in some of her smaller, explicitly commercial pieces, has been achieved by masking sections of the walls prior to spray-painting over them. The combination of the medium, and the outlines of what could be townhouses, are reminiscent of Berlin, and its streets of graffitied slogans. Accordingly, the work appears to signify many preoccupations current within German painting, most notably The Political and/or the absence of it. Numerous comparisons have been made between Grosse and her contemporary Jessica Stockholder, and also Karla Black. All three artists ‘colour over’ readymade objects, as well as utilising their readymade colours as elements within a larger whole; and in doing so blur the distinctions between painting, sculpture, architecture and land art. Yet both Stockholder and Black, unlike Grosse, are drawn to ordinary, everyday items, such as a plastic straw, or a lipstick say, as opposed to giant industrial equipment. Likewise, both Stockholder and Black, unlike Grosse, delight in the application of colour because it delights them, as opposed to signifying art, or art experiences. The South London Gallery has always been a difficult space to use on account of its excessively high ceiling. Much like its polar opposite—the Chisenhale bunker—softer, subtler pieces can be lost in it. For example, a recent touring exhibition, The Place is Here, 2017, fared much better at Nottingham Contemporary, where a series of adjoining rooms facilitated a more intimate engagement with the often personal, and politically charged subject matter. In direct contrast, Thomas Hirschhorn’s In-Between, 2015, and Michael Dean’s Sic Glyphs, 2016—installations that were very much dependent upon their passive-aggressive relationship to the architecture—worked well. Consequently, This Drove My Mother Up the Wall, which avoids the personal, signifies the political, and quite literally re-draws the gallery’s parameters, makes some kind of curatorial sense. Two documentaries, chosen by Grosse as a means to contextualise her practice, are housed upstairs. One, ‘The Gleaners and I’ (in French, ‘Les Glaneurs et la Glaneuse’, literally ‘The Gleaners and the Female Gleaner’) is typical of director Agnès Varda’s free-form style. The film focuses, primarily, on Varda’s interactions with those who live off, or glean, scraps from farmers’ harvests, but also includes an interview with an artist who makes work from others’ leftovers and with the winemaker and psychoanalyst Jean Laplanche, although it is only in later interviews that he and Varda acknowledge how his profession is also a form of gleaning. The other, directed by Claudia Müller, takes Grosse herself as its subject, and specifically her description of a fantasy exhibition made up of eight female artists. Fellow Berliner Isa Genzken, who, in the last decade, has become widely known for her assemblages centre stage, using the styles of architecture and other designer items as a means to explore different political ideologies. Again, the film appears not only to comment on Grosse’s influences, but also to make a statement about production and distribution within a wider feminist context. A recent publication on Abstract Expressionism contains a photograph of Jackson Pollock frantically shaking his overloaded brush, juxtaposed with one of Helen Frankenthaler gently, almost meditatively, pouring paint onto a canvas. There is little documentation of either Stockholder or Black at work, but it is easy to imagine a picture not dissimilar to this, latter image being used to represent their respective working processes. Grosse however, has often been photographed in a white boiler suit, rubber gloves and protective helmet, with canisters of pigment strapped to her waist. The fact that her methods do not conform to a feminist stereotype, albeit a positive one, is no bad thing; but the fact that, for her, the act of painting is such a clinical one does go some way towards explaining why the exhibition feels so sexless, and, so it follows, unsexy, despite the accompanying films/explanations/justifications for it. Grosse’s refusal to be cowed by the Gallery’s architecture aside, one wonders just what else her installation has to offer? Yes, it signifies something political, and it refers to feminism, to painting, and so too to the fashionable type of cleverness that goes along with it; but is this the same as actually being political, or feminist, or actually clever? Indeed, whatever intelligence the exhibition does possess comes from the way in which Grosse has, literally and metaphorically, masked vast sections of the space around her, thus creating room for curators and critics to construct meaning in it. This Drove My Mother Up the Wall provides a great excuse for fabricating theories, but as a work of art it is surprisingly empty.